The numbers speak for themselves: Under ‘Adequacy of safety-net benefits’, EVERY SINGLE INCOME GROUP has lost out. While others have suffered a great percentage drop, single working-age people remain the least able to make ends meet. That is the question posed every year by the Joseph Rowntree Foundation – and every year the organisation calculates how much people have to earn – taking into account their family circumstances, the changing cost of these essentials and changes to the tax and benefit system – to reach this benchmark. Increased tax allowances have eased the pressure somewhat for some households, but the freeze to child benefit and ongoing cuts in tax credits have outweighed this for low-earning families with children. Out-of-work benefits have fallen further and now provide just 39 per cent of what single, working-age people need to reach a Minimum Income Standard. On the other hand, pensioner couples who claim all their allowances receive 95 per cent of the amount required. The bottom line is that the Conservative-led government has been hammering the working poor and people on benefits, while claiming to be helping them. 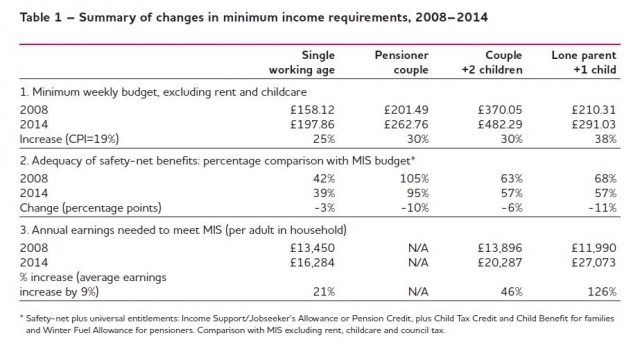 The minimum income necessary for an adequate living standard, according to JRF research, is no less than two-and-a-half-times what people on benefits receive. That is an appalling disparity in the sixth-richest country in the world. It also creates a danger that more people will look to loan suppliers like the government’s favourite (Wonga) for short-term help – at the cost of going into disastrous long-term debt. Slow earnings growth and price increases have made all households worse off on average, relative to the MIS, the report has found. The conclusion is a disaster for the Coalition’s “hardworking” people: “In the past six years the more important determinants of whether low-income households can afford the minimum budget have been the increasing cost of living relative to earnings and benefit cuts for households in and out of work. And the Conservatives have the cheek to use the slogan “For hardworking people”. As a civil servant in IDS’s DWP I don’t begrudge anybody a reasonable standard of living. I just wish my pay was enough that I didn’t need to claim working tax credits. Reblogged this on UNEMPLOYED IN TYNE & WEAR. A few years ago I had a dialogue with a person who considered himself a Libertarian. This person presented a hypothetical situation in which he had a business that made £10 per hour (or some such). He wanted to employ someone to share the load, and wanted to offer that person £2 per hour – well below the minimum wage and far below what he, himself was earning. He claimed THAT WAS FAIR – if the other person accepted it – because it was a contract freely entered. Dear reader, you may wish to list all the ways that he was wrong. With the fact that the unemployed have to pay a percentage of Council Tax, we need a pay rise! Wages are kept artificially low, partly by exploitive employers who pay less than they can afford and less than the employee deserves knowing the taxpayer will pick up the tab for the shortfall and partly by successive governments refusing to allow free collective bargaining by strong Trade Unions who are not neutered by repressive anti-trade union legislation. Please hire a proof reader, if your facts are wrong nobody believes the article. This information was taken from the press release on the Joseph Rowntree Foundation website – and you can see it for yourself in the graph at the top of the article. Something is awry that pensioners are all well to do, with more than enough money for the basics in life. That is not the picture of the people signing my petition, who fear the Flat Rate Pension leaving them penniless. There are pensioners whose sole income is the state pension. From 2016 Pension Credit ends. As does SERPs and the State Second Pension, so the additional pension means less not more state pension. There are a group of people being left in a void. Women between 60-66, no job fear losing benefit, no disability / sick benefits, no state pension so no pensioner benefits, no Winter Fuel Allowance or Cold Weather Payments. The Flat Rate Pension ends any state pension for a housewife with less than 10 years NI credits in her own right, which may be caused by too low a wage / hours per week in each individual part-time job. Widows also without 10 years NI credits will not inherit husband’s state pension from 2016. Even someone at 80 will lose a pro rata basic pension top up or the only state pension they will ever have had. If the Tories win in 2015, they will merge Income Tax and National Insurance Fund, and then we will never know how much money is left for the state pension and that money can be taken away, without needing to be refunded with interest payments as now. The elderly cannot be better off. They die at a rate of 30,000 a year from freezing to death in unheated homes. I can tell that a house with no central heating is colder than outdoors. I followed an old lady out the supermarket with barely a handful of the cheapest range food in her trolley and even right wing newspapers tell us the old have scarely £11 a week for food. Or no food one day to feed the pre-payment meter the next (the most expensive way to pay for energy). You are looking at pensioners with a good works, personal and/or military pension, along with the state pension. The state pension is the lowest against average wages in the developed world, bar bottom nation Mexico, according the OECD. With the Flat Rate Pension and then the Earnings Tax instead of NI and separate Income Tax, the state pension will wither away and leave the old with absolutely nothing, which was their fate under the New Poor Law and the Workhouse in the 19th Century by the Tories and Liberals (today called Lib Dems). The information in the article is that pensioners are only getting 95 per cent of the minimum income they need – that indicates they are losing money. They won’t go into debt as fast as job seekers who are getting only 39 per cent of what they need, but they will still go into debt. And, for the last time, can you please limit the length of your comments? I don’t have all day to read these things, you know!